neil (Neil Paine, senior sportswriter): Now that every NBA team has played Game 82 of the regular season, we can finally get to the real business at hand: The playoffs. Let’s start with the Eastern Conference, where the Milwaukee Bucks earned the franchise’s first top seed since the league adopted the 16-team playoff format in 1984. What do we think about the big picture in the East? The No. 1 Bucks and No. 2 Raptors were the most dominant during the regular season, but seeds 3 and 4 (Philadelphia and Boston) have as much talent as anybody in the conference on paper. Who do you think should have the edge and why? natesilver (Nate Silver, editor in chief): I’m going to go ahead and agree with our algorithm that there’s a big gap between the top two (Milwaukee and Toronto) and No. 3 and 4 (Philly and Boston). Milwaukee and Toronto were a LOT better in the regular season. I agree that Philly might have as much talent on paper, but they didn’t really get it together. I’m not sure you can say that about Boston, especially with Marcus Smart out. chris.herring (Chris Herring, senior sportswriter): Yeah. I spent some time around the Sixers over the past week, and Brett Brown admits what Nate just said: That the Sixers have an enormous amount of talent on paper, but he almost would’ve preferred to have less rest if it meant having more cohesion with that group. The Marcus Smart injury could end up being really problematic for the Celtics for a couple reasons, too — we don’t know exactly how much time he’ll miss, but it could even be a bad sign in this series vs. Indiana. Smart would have been the guy guarding Bojan Bogdanovic, who’s essentially taken over as the Pacers’ top gun since Victor Oladipo went down with injury. Bogdanovic struggled against Smart all season, and his worst numbers of the year were against Boston because of it. But now, I assume they’ll go to Jaylen Brown to defend him, and that hasn’t worked well at all in those instances. tchow (Tony Chow, video producer): Our predictions give the Celtics a 79 percent chance to advance. Even with the Oladipo injury for the Pacers, that still seems … high? chris.herring: Probably a little high, yeah. Especially now, without Smart. natesilver: I mean, I think people tend to underestimate how little luck there is in a seven-game series. The better team tends to win out, especially if it has home-court advantage. chris.herring: I tend to think the Pacers are The Little Engine That Could. They play very hard … but that will probably only get them so far. natesilver: For what it’s worth, our algorithm is giving Boston some credit for being more talented “on paper” than they played like during the regular season. Jayson Tatum is probably a better player going forward than what he showed this season, for instance. Gordon Hayward is obviously in a different category, but maybe him, too. Boston also had the point differential that you’d associate with a 52-win team instead of a 49-win team, which is not huge, but it’s something. chris.herring: Yeah. Hayward has come on really nicely as of late, including a 9-of-9 game vs. Indiana last week. If he’s getting back to his old self, it could be tough for Indiana. natesilver: It does seem, though, that it’s a team with only one real star-level talent right now, and Kyrie Irving seems pretty checked out. That’s subjective, I know, but they have a pretty big hill to climb — having to win three road series against three VERY good teams (likely Milwaukee, Toronto and Golden State, in that order) even if they get past Indiana. chris.herring: I’ll be honest: I’m not very amped about the East’s first round at all. But that second round will probably be eons better than the West’s conference final. neil: Yeah, it sounds from this like Boston-Indiana is the first-round series that has caught your attention the most. But that might be by default. chris.herring: I think Philly-Brooklyn could be somewhat interesting. It doesn’t sound like an absolute given that Joel Embiid will play Game 1. The Nets are essentially playing with house money, and though they’ve struggled as of late, they had a harder end-of-season schedule than the other teams fighting their way into the playoffs. natesilver: The Nets are kind of a buzzy team. But Philly, maybe in contrast to a Marcus Smart-less Boston, has enough talent that maybe they can be slightly subpar and still win fairly easily. neil: Haha. Let’s just play it out in NBA 2K. chris.herring: Maybe that isn’t fair to Orlando, though. They’ve been good for a decent amount of time now. neil: They’ve been on fire (11-2) since mid-March. chris.herring: I just feel like it ultimately won’t matter against a club like Toronto. natesilver: I also think Philly has more flip-the-switch potential than Boston. Maybe Jimmy Butler accepts his role as what’s essentially a third fiddle on offense and plays dominant defense and starts hitting 3s again. Maybe they treat the playoffs as a fun eight-week road trip instead of worrying too much about how the team is constructed in the future. tchow: Just tell me what needs to happen to get Sixers vs. Bucks in the Eastern Conference finals. chris.herring: I don’t know how I feel yet about the Sixers-Raptors series, assuming it happens. But I think the Bucks should be favored against everyone, honestly. I think everybody has downplayed them, even as they’ve had this unbelievable season, with the likely MVP and coach of the year. natesilver: The Raptors somehow won 58 games with Kawhi only playing 60. That’s seriously impressive. chris.herring: I don’t know if it’s a small-market thing. Or if it’s just that people seem to be a year late on everything. It is impressive! At the same time, they won 59 last year without him. So I’m more impressed by the Bucks essentially having the same cast and transforming into what they are now. I don’t know. Maybe it’s simply Milwaukee’s newness that I’m taken by. chris.herring: Nah. I’m not. Kawhi is such a different player than DeMar DeRozan, who had a game that didn’t translate all that well to postseason. Also, Pascal Siakam has improved by leaps and bounds. You could ignore him before on defense, and now that’s tantamount to having a death wish. natesilver: They also have one of the two real stars in the East that’s won a ring before (Kawhi, with Kyrie being the other). Which I know sounds like boilerplate sports radio talk, but our research has found that playoff experience is actually fairly predictive. chris.herring: I think Toronto fans have wanted to believe their team was different for a couple years now. Almost like that “Shawshank Redemption” scene where Red keeps going to the parole hearing and saying he’s a changed man, ready to rejoin society. But this time, the Raptors are different. Kawhi alone would have made them that way, but Siakam is a different player. As is Lowry, who hasn’t quite looked himself at all times. But has the experience, and has a better roster around him. natesilver: Our algorithm also thinks that all six of their top rotation guys are above-average defensively. So that’s likely to keep them in every game unless they get mentally checked out. Which, I don’t know. I wouldn’t totally rule out the possibility that they take a rough loss in a Game 1 or 2 somewhere and start panicking, and Kawhi starts thinking about how nice the Clippers could look next year with him in L.A. But on balance, I think I’m on the side that says people are reading too much into the Raptors’ past playoff failures. It’s a different team this year, and there’s no LeBron. chris.herring: Like the Munchkins when they realize the Wicked Witch is dead. Why do I keep using these movie references? What is wrong with me? tchow: As of right now though, our model actually favors Toronto (slightly) over the Bucks to make the Finals (46 percent vs. 42 percent). Toronto fans have to be happy to see that. neil: Do you guys agree? natesilver: Yeah, that surprised me a bit. But Toronto has more playoff experience and Milwaukee has some injury issues. tchow: I guess it’ll go a long way in the “playoff experience” argument to see how far a team like the Bucks go this year after that seven-game series last season against Boston. I have a hard time betting against them in the East though. natesilver: On the flip side, Giannis Antetokounmpo is presumably going to start playing 37-38 minutes a game now after only playing 32.8 minutes in the regular season. That actually makes a pretty big difference. chris.herring: That surprises me, but only a little. Their records aren’t that far off. The Raptors have played Kawhi a lot fewer games than Giannis. What I do think will be key at some point, which we haven’t talked about yet, is the Bucks’ need to get back to full strength. They’ve been without Malcolm Brogdon, and Tony Snell has missed time, too. It doesn’t matter in a round 1 matchup. But it comes into play in a very big way in the following two rounds, should they get that far. natesilver: I do wonder if Milwaukee’s whole floor spacing thing will work slightly less well in the playoffs. If you can contain Giannis — obviously not at all easy — there really isn’t a second iso-ball scorer on the whole roster. Maybe Eric Bledsoe, I guess. natesilver: Containing Giannis you mean? chris.herring: Before, there wasn’t much trust or belief. But now, you kind of either have to help in the paint against him, or leave open someone like Brook Lopez, who will gladly shoot a triple. There were screenshots last postseason of four Celtics standing in the paint at one time to stop him, because Milwaukee wasn’t trained to score outside of his drives to the basket. Now, even Giannis will pull 3s every now and then, just to keep defenses honest. Bledsoe’s had a nice year. Lopez is there, but wasn’t before. natesilver: I guess I’m saying a team like Toronto that is quick (at least with certain lineups) and can switch a lot, maybe they can contest that Lopez 3. Or get a few steals when the Bucks telegraph their intentions too much. tchow: Nikola Mirotic also may be back in time for Game 1. So yeah, the Bucks will have shooters. neil: And for what it’s worth (maybe something? ), Milwaukee beat Toronto in three of their four regular season matchups. Those games were also before all the little upgrades Milwaukee made around the trade deadline. But we’ll have to see how the Bucks look at full strength and if they and the Raptors can even make it all the way to the Conference Finals to face each other. Let’s move on to the West, where — here’s a surprise — the Golden State Warriors are the No. 1 seed, for the fourth time in five years. Our model currently gives the Warriors a commanding 78 percent chance of winning the conference (and a 60 percent chance of winning the NBA title). On the one hand, that is amazingly high, but does it sound right to you guys? natesilver: The West playoffs feel a lot less climactic to me now that the Rockets wound up on the same side of the bracket as Golden State. chris.herring: It sounds about right to me. The one side of the West bracket is the equivalent of Michigan State and Duke being in the same region. natesilver: Utah is also a pretty rough first-round matchup for Houston. Rudy Gobert is going to make it much harder for James Harden to get to the rim. neil: Well, Chris, we were talking the other day this idea that the Rockets may have actually wanted the No. 4 seed so that they’d face the Warriors sooner. Can you explain a little about what you meant there? chris.herring: I fully believe the Rockets may be happy with this setup. At this point, they’re probably of the opinion that they can beat anyone other than GSW (and maybe them, too). Utah isn’t a pushover at all. It’s kind of an amazing first-round matchup that, in most years would be at least a second-round matchup, and in a post-Warriors universe, maybe even a conference finals. But that said, Houston beat Utah last year. And they did it by neutralizing what the Jazz do best: Take away threes and the rim. They forced the Rockets to take midrange shots, which they basically view as evil. But the Rockets did that — Chris Paul is a midrange specialist and went off for 40 points one game — and were able to win. So if the Rockets can get by Utah again, having the Warriors in round 2 instead of the Western Conference finals might be beneficial. Just so Paul and Harden aren’t exhausted or injured like they were by round 3 last season, when they played the Warriors. natesilver: Yeah, I think Chris Paul is key in that series. Utah’s pretty optimally designed to curb Harden as much as you can curb him, but CP3 is a big problem for them. natesilver: Overall, though, I think if I’m Houston, I’d rather have a hope-and-a-prayer that someone else knocks Golden State out before they reach the finals. Or that someone on the Warriors gets hurt. chris.herring: Yeah. They’d never admit it out loud, but the potential theory that they want GSW early is fascinating to me. If your line of thought is that you’re almost certainly gonna have to go through them anyway, might as well do it before you’re too spent to have a chance. neil: Right, because fatigue seemed like a big issue for them by the Western Conference finals last year. 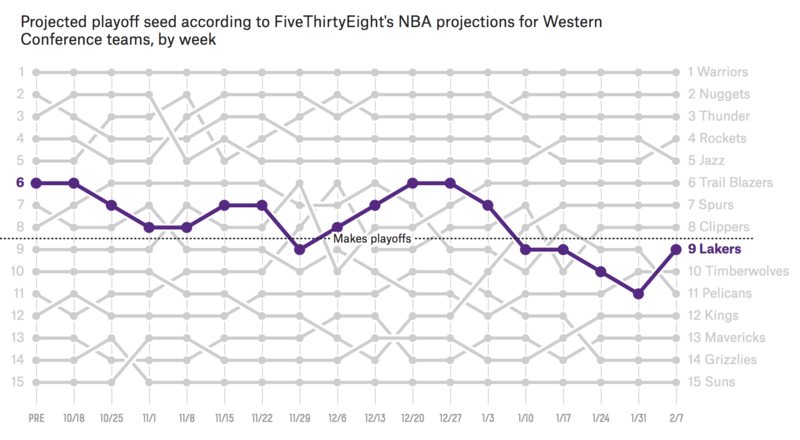 natesilver: It could make the Western Conference finals pretty boring though. Our model says there’s a 93 percent chance the Warriors win the WCF (!) conditional on reaching them. chris.herring: Yeah. That’s why I keep saying the semifinals are gonna be the best round this year. Especially if Houston-Golden State is the matchup, along with those East series. tchow: Hey kudos to Oklahoma City for avoiding Golden State AND Denver AND Houston. Actually, OKC vs. Portland is the only series in the entire playoffs where the lower seed is favored according to our model. We give the Thunder a 78 percent chance of advancing. natesilver: OKC and Denver saw their championship odds improve when Houston wound up in the No. 4 seed, and it’s mostly because of the parlay that Houston beats Golden State (possible) and then THEY beat Houston (also possible). I’m not sure that Denver would have any chance against Golden State in a seven-game series, however. chris.herring: I feel bad that I don’t believe in Denver, given how well they played all year, with injuries, and with so many young guys on that roster. neil: Is Denver the weirdest No. 2 seed we’ve seen in recent memory? They didn’t even make the playoffs last year, albeit with 46 wins. chris.herring: Also, every single time Denver plays Golden State, it feels very much like GSW goes out of its way to show how easily they can dominate the Nuggets when they want to. Basically to show that a playoff series could get embarrassing if Golden State felt like imposing its will. natesilver: The Nuggets benefited a lot from their depth in the regular season — that’s why they battled so well through injuries — but depth doesn’t mean much in the playoffs. chris.herring: Their relative inexperience in the playoffs concerns me maybe more than it should. natesilver: It’s a pretty weird roster, and I think the Nuggets have some offseason work to do to turn a couple of their many, many league-average players into another really good player, especially someone who can play out on the wing. chris.herring: Part of me feels like they simply may not have another gear. Almost like those Tom Thibodeau teams. Because they’re young, perhaps they don’t know to pace themselves. And how could they? They missed the playoffs in the final game of the season last year. But the fact that Golden State just runs them out of the building whenever they play very much feels like an experienced team versus one that isn’t and needs some playoff seasoning so that they’re ready for the next time. neil: They feel destined to become another poster child for the difference between what wins in the regular season and the playoffs, for all the reasons you guys mentioned. But at least they do have a legit star in Nikola Jokic. natesilver: Denver does have a pretty big home-court advantage because of the altitude. So that they got the No. 2 seed is actually pretty relevant. neil: Good point. They were an NBA-best 34-7 at home this season, and they are in that relatively lesser bottom section of the bracket. natesilver: I mean, we have the Nuggets with a 53 percent chance of reaching the Western Conference finals … and a 6 percent chance of reaching the NBA Finals. That tells you a lot right there. chris.herring: What else are you all interested to see in the West? Any hope whatsoever for Portland, despite the injury to Jusuf Nurkic? neil: Portland is another team with a lot to prove after that unexpected first-round sweep vs. the Pelicans (remember THEM?) last year. But OKC is a very tough draw. chris.herring: Portland got swept this year by OKC. Our projection model is right to not trust them. And Nurkic not being there is a killer. They had put together a really, really nice run before his injury, and perhaps could have made things interesting. tchow: I really feel for Portland fans. So many “what ifs” due to injury, and they always seem to happen when it looks like they’re on the cusp of putting it all together. natesilver: Pretty unusual to have a No. 6 seed be better than a 3 to 1 favorite (OKC is 78 percent to win the series, according to our model), but I think I agree, too. natesilver: The Thunder are also the team that I’d fear the most if I were Golden State after Houston. chris.herring: Damian Lillard went nuts during the regular season against the Thunder. Had a 50-point game and averaged better than 30 a night against them, yet they dropped all four meetings. tchow: Is CJ McCollum going to be back for this first round? chris.herring: Yeah. McCollum is back. But he had a true shooting percentage of 46 against OKC, his worst mark of any opponent out West that he played at least three times. natesilver: Tenacious defense + Paul George (especially if he can get back to his midseason form) is a formula that gives you a puncher’s chance against any opponent. chris.herring: I don’t trust OKC yet. Some of that is Russell Westbrook’s tendencies being all over the place at times. Some of it is George not having played the way he was playing earlier in the year (still not sure his shoulder is completely right at times). Their defense, which is one of the best in the league, has been merely average since the break. They don’t have enough shooting. But their top-level talent is better than anybody else’s, outside of Houston and GSW. And that ultimately matters. And their side of the bracket is amazing. natesilver: Jerami Grant shot 39 percent from three this year, although that’s likely a fluke (he’s 33 percent careerwise). chris.herring: He’s been a big bright spot for them. natesilver: If they had another wing that was a true 39-40 percent 3-point shooter, that would make a ton of difference. neil: OK, so to wrap things up, let’s look at the big picture for the title as it runs through Golden State (like always). If we each had to put together a short list of teams — from either conference — who could beat the Warriors in these playoffs, how many teams would be on it and who are they? Mine might be two: Rockets and Bucks. natesilver: Our algorithm feels strongly that the list is EXACTLY three teams long: Milwaukee, Toronto and Houston. natesilver: I guess people — or Neil and Tony, anyway — have trouble envisioning the Raptors doing it. natesilver: And to be clear, the Raptors would be big underdogs. Like 3:1 underdogs, per our model, despite having home-court advantage. tchow: Another way to ask that question, Nate, as a fan of gambling, Warriors have a 60 percent chance of winning another title. Would you bet on the field? natesilver: No. I think that’s a pretty fair price. And it’s pretty close to the Vegas odds, I think. chris.herring: Yeah. I feel much better about Milwaukee, just based off their season, analytics and star power than anyone else. But I don’t think Toronto would match up poorly at all with Golden State. They’d have guys who could credibly guard Kevin Durant, Steph Curry and Klay Thompson and have enough offense of their own to make things interesting. Boston seemed like a good bet to get there in preseason, but I don’t trust them to accomplish that without Smart being healthy., a And without them putting together a solid string of performances, I still ultimately think it’s the Warriors winning it all again. But I hope someone at least gives them a competitive series, be it Houston, Milwaukee (Toronto?) or both. chris.herring (Chris Herring, senior sportswriter): While there wasn’t the blockbuster deal that some thought might come at Thursday’s NBA trade deadline, there were plenty of moves — and non-moves — that affected each of the top teams in the East and will factor heavily in the playoff race from here on out. neil (Neil Paine, senior sportswriter): Chris, this has to be up there with the most active deadlines ever. chris.herring: So what stood out to you all as the deadline came and went? The trades themselves are over, but a number of teams seem likely to keep an eye on the waiver wire for big names that could become available via buyout. I have to be honest: I loved Milwaukee’s trade for Nikola Mirotic. chris.herring: They took four second-rounders and the spare parts they got in deals from the past couple of days to get a stretch big who fits their offense perfectly. Tobias Harris is a more complete player than Mirotic, but the fact that they could get the deal done without giving up much on the personnel side was really impressive. chris.herring: The Sixers could have benefited from a deal like Milwaukee’s. neil: Yes, the Sixers gave up a ton in that Harris deal. tchow: The thing that stood out to me is it seemed like Toronto, Milwaukee AND Philadelphia all made moves with the assumption that their time is NOW. They all seem to believe they can win, if not the NBA Finals, then at least the East. Now, obviously, all three of them (four if you include Boston) can’t make it out on top, so it’ll be interesting to see who, if any, regrets these moves at the end of the season. natesilver: The Celtics were the biggest losers because all three of the other Eastern contenders made trades that make them much tougher outs. Obviously Philly gave up a lot more to do it than Toronto or Milwaukee did, and I agree that the Mirotic trade is the best of the three. natesilver: The opportunity cost of not making a move is pretty high if you’re Boston. Especially if they’re now underdogs to make it out of the second round, which won’t help their case for keeping Kyrie Irving. chris.herring: I actually didn’t feel like Boston was a massive loser here. On the one hand, yeah, they didn’t change the roster. But they also seem to have played a role in Anthony Davis not being moved, which is a win in some ways, no? I guess it depends on whether you’re looking at short-term (which you probably have to, since the Celtics are a contender) vs. long-term/summer. neil: Certainly Davis staying in play for the summer is a win for Boston, although Davis’s agent and his father have said he’s not interested in signing long-term in Boston. natesilver: My thing is like: Kyrie has very openly flirted with the idea of leaving. And both the Knicks and the Clippers, two of the most attractive destinations, have totally cleared their books in way that make them very plausible fits for him. natesilver: The Celtics have to fade a lot of risks: AD openly griping about going there, Kyrie not leaving, the Knicks getting the No. 1 (or maybe the No. 2?) pick — in which case their offer for AD could be pretty darn attractive — and maybe none of the Lakers players having a breakout in the playoffs, which would make them more attractive trade assets, too. tchow: Yea, if the Celtics get knocked out in the first round or even the second round of the playoffs this year, I feel like they’re going to really regret not making any moves before this deadline. chris.herring: Maybe I’m just of the opinion that the Celtics doing nothing AND watching AD get dealt to the Lakers would’ve been worse for them. chris.herring: I don’t know if I would have liked them dealing for Harris, who is kind of a taller Jayson Tatum with less upside, given their difference in age. tchow: Maybe? Right now, we project them to be a 9 seed. chris.herring: That’s a good question, Neil. natesilver: We have them as 2-to-1 underdogs, although they’re going to benefit from the Clippers semi-tanking. And maybe our numbers don’t account for motivation, as much. neil: Hard as it is to believe a LeBron James team misses the playoffs. chris.herring: The Clippers are interesting because even after dealing Harris, they aren’t by any means in a bad spot. natesilver: Yeah, the Clippers have a lot of guys on expiring contracts, so they have incentive to play hard. In the abstract, the Kings are not tanking, but our numbers hate Harrison Barnes, so that trade didn’t help their chances at all. I like that they’re going for it. But I didn’t love trading Justin Jackson. The Bulls’ deal for Otto Porter was better, IMO. neil: But it also felt like the Lakers and AD overplayed their hand a little here. It felt like an orchestrated effort to bully the Pelicans into trading a generational player for less than attractive prospects. And the Pelicans didn’t blink. To hear some tell it, out of spite. chris.herring: There were a handful of things that played out today that I didn’t understand. tchow: Fellow Justin Jackson fan here, checking in. chris.herring: Toronto’s deal for Marc Gasol was interesting. He’s a former defensive player of the year but has slowed down. You deal Jonas Valanciunas, Delon Wright, CJ Miles and a second-rounder for him. I don’t know how much better that makes the Raptors. Maybe Gasol is less of a defensive liability, but Valanciunas could beat up on second-string bigs pretty well. And I like Wright’s versatility at times. What did our projections have on that one? The way the Raps handled deadline was interesting. You kept hearing Lowry’s name floated around, etc. neil: Our projections still like Gasol quite a bit. Mainly for his defense. chris.herring: Also, to Nate and Neil’s question about the Lakers, at this point, I’m more interested in how the youngsters play from now on. Many of them had never been through this, with it being public that they’re all for sale. How they respond, how hard LeBron pushes himself and how much the Lakers push him will say a lot about whether they’re in the playoffs. It may not be totally worth it for LeBron to push himself to the limit, given how old he is and how slim a chance they have of taking out the West’s contenders. 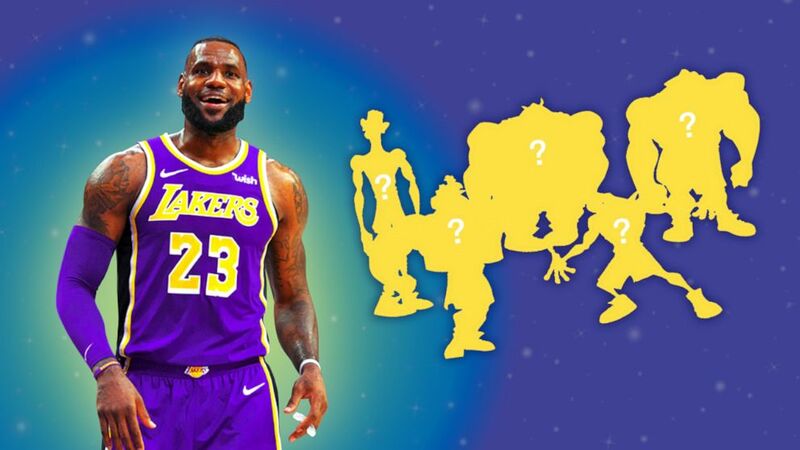 natesilver: I think literally every player on the roster other than LeBron was rumored to be going to New Orleans at some point, which can’t have helped with morale. neil: Probably no coincidence they lost by 40+ on Tuesday. natesilver: Plus, the Lakers’ plan B isn’t that bad. Sign Klay Thompson or something this summer, give the young guys more chance to develop, and be opportunistic; there are still several ways you could end up with AD, and if you do, you’re going to have a lot more assets to surround him and LBJ with. chris.herring: Some teams surprised me by not making a deal today. I thought Atlanta — with guys like Kent Bazemore, Jeremy Lin — could have dealt away a vet to get something in return. Utah seemed to want Mike Conley, yet Memphis decided not to trade him just yet. But I love Orlando getting Markelle Fultz. They badly need someone at point guard. So I like the first-round pick as a gamble there. tchow: But our projections HATE Fultz, Chris. chris.herring: Of course. He hasn’t been good yet! neil: I don’t think anybody’s projections know what to do with Fultz. natesilver: Fultz isn’t a guy that projection systems are set up to deal with. chris.herring: One team that continues to confuse me some is Houston. They kind of cheaped out. Moved James Ennis for very little. Picked up Iman Shumpert, but also dealt away Nik Stauskas right after landing him in a trade. All seemingly to stay beneath the luxury tax. Those guys could’ve been useful. Maybe not great, but useful. On a team with a ton of injuries and little depth. It would be interesting to know how James Harden views that sort of thing as he’s doing everything by himself, damn-near. natesilver: Shumpert with good coaching/management could be an interesting fit. But yeah, Daryl Morey is sort of a home run hitter, and this felt like him fouling off a few pitches instead. chris.herring: True. They’ve always been bold, when it comes to certain things, that boldness pays off. They washed their hands of Carmelo Anthony a lot earlier than some would have, but they turned things around shortly after. Now the Lakers are interested in picking Melo up off the waiver wire, apparently. Not everybody has been bought out yet. But there are a few key ones, Tony. Among them: Robin Lopez, who’s thought to be headed to the Warriors. Wesley Matthews, who sounds set on Indiana. natesilver: What if Houston traded Chris Paul for the Lakers’ young guys this summer? Not that crazy if AD goes elsewhere, right? chris.herring: I don’t think the young Lakers shoot well enough to put them around Harden. But that idea is still kind of fascinating. I don’t trust CP3 health-wise beyond this year — especially not with that money he’s making. So they would be smart to get something for him if someone is willing to give them a king’s ransom. natesilver: The 76ers really need a buyout guy. The drop-off from their starting five to their bench is about as steep as you’ll ever see. tchow: Scouring on NBA Twitter right now, and Wayne Ellington (Tar Heel!!) is another name that is being mentioned a lot. chris.herring: Yeah. Ellington def isn’t playing with Phoenix, so he’s another — maybe to the Rockets, even. He waived a no-trade clause to leave Miami, so he’d probably only join a contender. natesilver: Speaking of Philly, the Fultz move actually opens up some cap space, so they could decide to keep Harris and target another max guy if Jimmy Butler leaves. chris.herring: That Harris deal was such a big, interesting move for them. Being able to keep him as insurance depending on what happens with Butler — who isn’t my favorite long-term max option anyway — is huge. Harris is also a lot younger than people realize because Philadelphia is already his fifth team at age 26.
natesilver: I like it more for the Sixers than a lot of people do, in part because it gives them several different options going forward. natesilver: Also, if Ben Simmons is your point guard, you need forwards who can make a 3.
chris.herring: I was tough on them last year, but can we circle back to the Pistons right quick? Because they are seemingly punting on this season. They gave up Stanley Johnson for Thon Maker, which I don’t mind on its own. Thon could be good. But they dealt away a very decent/good player in Reggie Bullock to the Lakers. neil: And according to our projections, Detroit has a 56 percent chance of making the playoffs! chris.herring: Like, there’s a possibility they could be trading themselves out of the playoffs. Now, maybe that risk isn’t terrible — especially now, with what happened with the Wizards. neil: Making the playoffs is a pretty low bar, especially in the East. But Detroit has only done it once since 2009.
natesilver: Top to bottom, Detroit has to be in one of the worst situations in the league. They’re stuck in that in-between zone, but without very many young assets to pull them out of it. tchow: Yea, I was about to say. Detroit making the playoffs might be surprising, but if you look at the East, who else would be the 7 or 8 seed that seems more probable? 56 percent seems about right to me. chris.herring: Miami. I trust Erik Spoelstra and that group more than Blake Griffin and the Blakettes. natesilver: If the Pistons decide they want to blow things up, then I wonder if they’d consider moving Blake this summer. chris.herring: I guess they probably want to build around him going forward. But yeah, Blake probably should be moved. He could make several teams really interesting. tchow: Man, I feel so bad for Wizards fans. chris.herring: Yeah. Speaking of the Wizards, I liked the Bulls jumping in on the Otto Porter situation. Some Bulls’ fans didn’t like it. But Chicago has done literally nothing to make itself more appealing to free agents this summer. So they sacrifice that space by getting Porter, who’s young. But they at least have a young vet who is decent on both ends to put around that young core. natesilver: There are so many teams with max cap slots open that some of these “bad” contracts, e.g. Blake or CP3 or maybe Kevin Love, could start to look like assets. All of those guys can still play obviously, but they get very expensive in the back half of their contracts. tchow: Aren’t all those teams waiting for the summer though, Nate? natesilver: Yeah, I think the summer is going to be totally wild. Dallas also cleared a max slot, or close to it. chris.herring: Yeah! The Dallas situation was big. Last week, when we discussed them, we talked about how they didn’t have space. By moving Barnes now, they do. Accelerates the timeline quite a bit, which you obviously want to do now that you have Luka Doncic and Kristaps Porzingis together. The way the Pelicans handled this whole scenario is ridiculous. tchow: The NBA is the pettiest league. But that’s also what makes it the best league. chris.herring: Although the Lakers’ core wouldn’t have had me excited to make a deal, either. neil: No, and I think part of it was New Orleans feeling like planting a flag for the small-market teams of the league. The Lakers can’t just have anyone they want whenever they want. natesilver: If Lonzo Ball and Brandon Ingram had played, like, 20 percent better this season, everything would be so much easier. chris.herring: I think the Pelicans’ social media team just called the Lakers’ offer the equivalent of the Fyre Festival. neil: I didn’t realize FuckJerry was referring to Jerry Buss. natesilver: But maybe the Lakers deserve some blame for that. The chemistry around the team is really weird and there are a lot of mixed messages about what their objectives are. chris.herring: Completely. I don’t think it was ever fair to assume they could get the deal done. But I do understand L.A.’s frustration if, as reported, they weren’t even getting counteroffers back from the Pelicans. natesilver: A lot of the better deals of the past few years, like Paul George or Kawhi Leonard or on a smaller scale Mirotic today, are just about teams being opportunistic. Instead of trying to call their shots. chris.herring: Yeah. It would’ve been something had Milwaukee or Toronto been able to land Davis. Probably too big of a gamble for Toronto, and maybe Milwaukee didn’t have enough outside of Giannis. But the gamble for PG paid off; especially considering OKC generally isn’t in play for the biggest free agents because of location. natesilver: It was sorta funny that AD’s list included the Lakers plus three teams that didn’t really have pieces that fit. neil: Yeah, there was another conspiracy theory floating around that that was to provide cover when eventually talks circled “back” to the Lakers. chris.herring: Yeah. It was Lakers or bust this whole time. natesilver: If the Knicks get the No. 1 pick, what are the odds they flip it for Davis? Gotta be at least 50/50, no? It just feels like a very clean transaction. chris.herring: Nate, I think the Knicks would be very well-positioned if they win the lottery. They would have the No. 1 pick (Zion Williamson), two recent lottery guys — in Frank Ntilikina and Kevin Knox — AND the future first-round picks they just got from Dallas. I don’t think too many teams can touch that. Not a whole lot in the way of players who can make a big, immediate impact. But Zion alone is something you can sell to your fans, as well as a boatload of future picks. And now that the Davis saga is being pushed out to the offseason — and with Boston perhaps being put in a weakened situation, given the lack of clarity around Kyrie — the team that wins the lotto could be best position to make NOLA an offer. neil: I love the East horse race this season! I think the favorite changed hands, like, three times in the last few days. Everyone is making their move now that LeBron is out of the picture. tchow: The King is gone — the throne is wide-open. It’s like “Game of Thrones” in the Eastern Conference. chris.herring: I really do like the Mirotic trade for Milwaukee. When I tweeted about it, someone said, “Yeah, but how does he help them against Golden State?” Milwaukee hasn’t gotten out of the first round since 2000. They have a real chance to make the finals now, with an elite player, offense and defense and an explosive scheme that allows them to rain threes. neil: Right, Ray Allen and Sam Cassell were Bucks the last time they were in a spot like this. chris.herring: Mirotic isn’t perfect. But he really helped AD and the Pelicans down the stretch last year. Can certainly help Milwaukee. tchow: All right, enough about the trade deadline. Who’s ready for the All-Star draft? When he was hired in May to coach the Milwaukee Bucks, Mike Budenholzer inherited a promising but underachieving core of young players led by Giannis Antetokounmpo. The Bucks — who have not won a playoff series since 2001 — had just suffered yet another postseason disappointment and hoped a coaching change would help them escape perpetual mediocrity. To say the results have been encouraging would be an understatement. Budenholzer has implemented a new and more modern offensive strategy that is utilizing Antetokounmpo’s unique talents like never before. Under Budenholzer this season, the Bucks are scoring at a conference-leading rate of 113.2 points per 100 possessions. The team has the best record in the NBA, has won 10 of its last 11, and has already beaten conference rivals Boston, Philadelphia and Toronto (three times now). Milwaukee is heading into All-Star weekend as perhaps the most intimidating team in the Eastern Conference. So, yes, the coaching change has worked. But what exactly has Budenholzer done — and why is it working so well for the Bucks? One strategic change was clear even back in the preseason when Budenholzer rolled out his new offense. Last year, the Bucks attempted just 24.7 3-pointers per game (25th-most in the league). Under Budenholzer, they have pumped up their long-range volume to 37.8 3-pointers per game, second-most in the NBA this season (trailing only the Houston Rockets). But Budenholzer has done more than just open the 3-point flood gates in Milwaukee this year: He has engineered a sea change in shot selection. 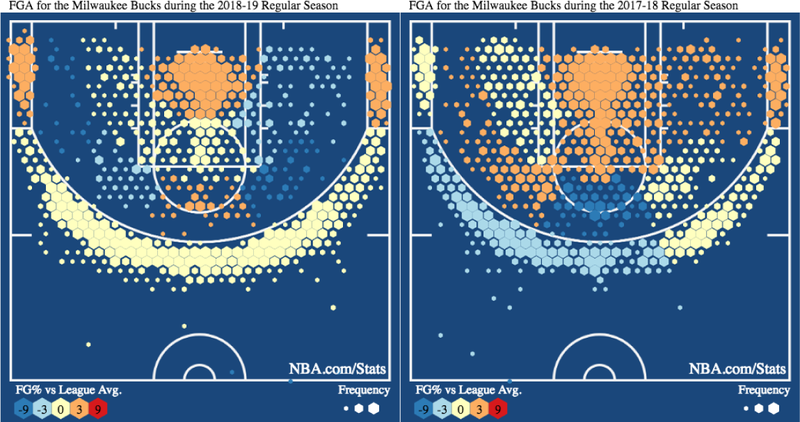 This season, the Bucks have done more to modernize their shot chart than any other team in the league, as shown in these year-to-year charts.1 Their share of shots taken at the rim or behind the 3-point line — referred to as the Moreyball Rate, after Houston general manager Daryl Morey — has jumped by 16 percentage points, according to data compiled by PBP Stats. Correspondingly, their average 2-pointer is being attempted from a shorter distance, about 2.5 feet closer to the hoop. And everybody on the team is cutting back on midrange jumpers. The Bucks’ transformations in Moreyball Rate and 2-point shot distance are the biggest changes by any team in the NBA from last season to this one. In fact, the Bucks’ sudden modernization is among the most drastic changes in shot selection by any team during the entire era of play-by-play data (available since 2001-02). Appropriately, Morey produced the biggest Moreyball makeover in league history during Houston’s 2012-13 season, James Harden’s first with the team. Fundamentally, the Bucks have achieved their impressive offensive efficiency on the strength of the two principles of Budenholzer’s offensive philosophy: pace and space. Budenholzer’s emphasis on court spacing has been emblemized by the image of five “stand-here” squares he had taped to the floor of the Bucks practice court, surrounding the 3-point line. By initiating their offensive possessions with all five players outside the 3-point line, the Bucks leave more space for Antetokounmpo to attack the basket. Once Antetokounmpo draws attention around the basket, he’s free to kick the ball out to open 3-point shooters in space. It’s a positive feedback loop that yields easier shots for Antetokounmpo and his teammates. The Bucks’ improved floor spacing has been facilitated by some shrewd front-office maneuvers. The team signed capable stretch bigs Brook Lopez and Ersan Ilyasova on team-friendly contracts while at the same time cutting ties with paint-clogging centers Greg Monroe, Tyler Zeller and, most recently, John Henson. With all that extra space, Antetokounmpo has been attacking the basket relentlessly this season. Since last year, he has increased his volume of drives per game from 11.0 to 12.9; his paint touches are up from 5.3 to 6.5 per game; and he’s now taking more shots at the rim (523) than any other player in the league. These additional basket-attacking duties have put the onus on Antetokounmpo to read the defense and distribute the ball to his teammates. The result has been a career high in assists for Antetokounmpo this season (5.9 per game), with an emphasis on kick-out dimes. On 289 total assists this season, Antetokounmpo has set up a teammate for a 3-point basket 168 times (58 percent), while he has assisted a teammate in scoring a 2-point basket just 121 times (42 percent). In other words, Antetokounmpo has created 262 more points via assisted 3-pointers than he has via assisted 2-pointers this year. That is the biggest such margin of any player in the league and it’s not even remotely close — Detroit’s Blake Griffin is second with 98 more points assisted on 3-pointers than 2-pointers. Among the top-30 assist leaders this season, Antetokounmpo and teammate Eric Bledsoe are two of only seven players who have created more points via assists on 3s than on 2s. At the top of the list, Antetokounmpo finds himself in the company of a few other big ball handlers — Griffin, Ben Simmons, Luka Doncic — who can distribute to their teammates from the inside out. LeBron James, who is basically the prototype for this point-forward approach, assisted on 344 of his teammates’ 3-pointers in Cleveland last year (for 1,032 points), more than any other player in the NBA. (He created 226 more points on the 3s he assisted than on 2s.) Antetokounmpo is on pace to post a similarly lopsided distribution of assists this season. Impressively, when Antetokounmpo has been on the court this season, 89 percent of the Bucks’ 3-pointers have been assisted; that’s 11 percentage points more than the team’s assisted-3 rate when he’s been on the bench. The Bucks’ improved spacing seems to be helping Antetokounmpo create all the right shots for his Milwaukee teammates. Establishing a faster pace has gone hand-in-hand with the Bucks’ efforts to create better spacing. Budenholzer has emphasized playing with urgency and purposeful movement, and the team has shaved nearly a second off the duration of its average offensive trip (from 14.0 to 13.1 seconds per possession). According to Synergy Sports, the Bucks have attempted fewer field goals this season during the last seven seconds of the shot clock (from 19 percent of all field-goal attempts to 15 percent) and have correspondingly increased the proportion of their attempts (from 59 percent to 65 percent) that are attempted with somewhere between seven and 18 seconds remaining on the shot clock. Antetokounmpo helps push the pace for the Bucks. Budenholzer has instructed his lanky star to dribble the ball up the court immediately after securing any defensive rebound, which has created more uptempo half-court possessions and shots in semitransition. The Bucks are shooting better when they keep their offensive flow uptempo like this — with an effective field-goal percentage of 56 percent on shots taken with between seven and 18 seconds left on the shot clock and just 48 percent on their more slowly developing shots. A new and more modern offensive approach predicated on floor spacing and pace, along with some smart personnel decisions, have helped Budenholzer unlock the immense potential of the Bucks’ young superstar. Perhaps when they hired Budenholzer the Bucks would have been happy with winning a playoff series. But with Milwaukee in pole position for its first conference championship appearance in nearly two decades, the Bucks now have eyes on a bigger prize. The older Milwaukee generation is surely reminiscing of the summer of ’71 — the last time there was a transformative young star in town. And who knows, maybe this season will end like that one, with an NBA championship for the Bucks.